Your Airedale terriers tail won't hold his interest for long. 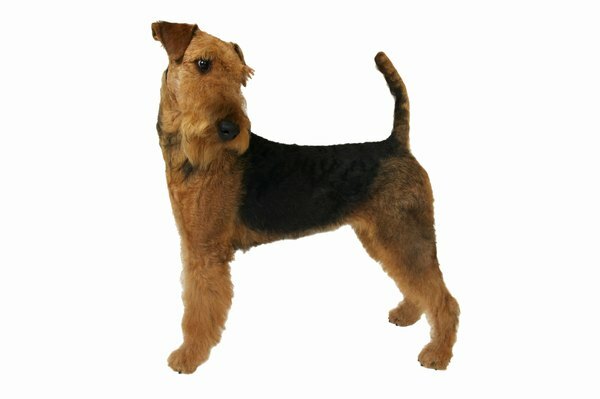 While it is not recommended that you provide a constant supply of otters and rats for your pet to hunt, Airedale terriers do need a constant variety of activities to prevent boredom. Their intelligence means that simple games and toys can become old fast. Take your dog on different routes for his daily walk, which should be long and engaging. As with all things Airedale, variation is the key to holding his interest. Try to include a stretch in the walk where he can run off-leash. Invest in a couple balls and Frisbees and practice your throwing technique. Fetch might be a simple game but Airedales and other hunting dogs love it. Fetch is basically a chase game, with the toy taking the place of a prey animal. Provide a selection of toys that he can play with by himself, including some that involve solving a puzzle, such as extracting a treat from a sealed container. Rotate the toys -- give him two or three a day and change them the next. Take him to an obedience class and then advanced training classes. Advanced training poses a mental challenge because of the concentration required. For the same reason, it is worth spending time to teach him a series of progressively more complex tricks, not just to show off to your friends, but also to exercise his brain. Consider employing a dog walker, perhaps a teenage neighbor, to take your pal for extra walks during the day, especially if you work long hours. Because they originally were bred as hunting dogs, Airedales have an instinct to chase anything small and furry. If the off-leash part of your walks includes areas with wild animals or birds, which it almost certainly will, spend time training your dog to ignore these animals before letting him run freely. Letting him chase pigeons and squirrels might look harmless, but it could end up with him harassing an endangered animal, getting into trouble with livestock or receiving a nasty bite. To save money, try making some toys yourself. For example, conceal bits of dog kibble in a tough plastic bottle with the top off to make a cheap puzzle toy. Watch your dog while he’s playing with it, to ensure he doesn’t chew or swallow the plastic. Do Steroids Cause Excessive Thirst in Cats?